For a 9 hole course, Saticoy Golf Course in Ventura, Ca, is still a fun little place. This course offers affordable Ventura golf deals for beginners and experienced players with a little time to do some work on their game. This course is located within 9 miles of the Pacific, about 30 miles from Santa Barbara. 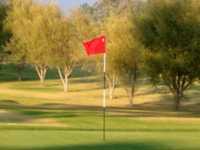 The Saticoy Golf Course was designed by the renowned George C. Thomas and opened in 1926. This 9 hole course (par 34) covers 2,723 yards from the back tees. With one par 5, five par 4s and three par 3s, the course has a rating of 65.4 with a slope of 109. The course is short and fairly flat. There are no water hazards, but you will find 17 bunkers guarding 7 of the 9 holes. This is a terrific place for beginners to just tee it up and learn to swing the club. When making your Ventura tee times, you will find the Saticoy Golf Course discounts to be a great value. Reservations may be handled online or through the course starter. Amenities include a nite-lit practice facility, a pro shop, club rentals, and a snack bar. Beginners really like this course as it allows them to gain experience without the stress of dealing with hazards and losing balls.